When I learned that Kris Waldherr, author of the wickedly fun book “Doomed Queens”, had a new book called “Bad Princess” coming out I knew I had to read it. I didn’t care that it was intended for ages 9-12 years-old. And yes, “Bad Princess: True Tales from Behind the Tiara” is geared for younger readers, but it still has much to offer anyone interested in learning about the true nature of royalty. In spite of its slender 130 pages of larger size font, “Bad Princess” is full of interesting and fun facts about the fate of royal daughters throughout history, folklore, and fiction. As you may surmise from the title, being a “good” princess in the past seems less desirable than the way “bad” princesses lived their lives. Along with tons of factual information Waldherr maintains her reputation for fun by also including a “Tournament of Princesses” which pits Princesses of history against Princesses from stories. There is also a cute board game called “Princess: Paths to Power”. In it you try to dodge getting tossed into dungeons, avoid bad marriages and squabbles with other Princesses, to ultimately take your place as Queen. 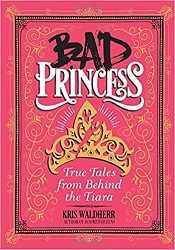 “Bad Princess” by Kris Waldherr is fun read for everyone. To learn more or purchase a copy visit here.